This unique "I Make It Happen Green Leaf" Men's T-Shirt is a Wanda Hope Carter design featuring a line from her best selling creation "To Achieve Your Dreams Remember Your ABCs," integrated into a graphical leaf image that she designed. 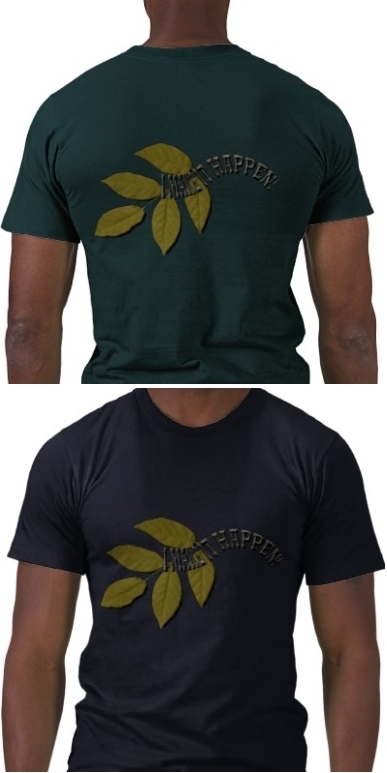 This "I Make It Happen Green Leaf" T-Shirt is cut to give a flattering stylish fit to virtually any body type. With its finely combed 100% extra soft cotton content, it is one of the most comfortable garments that we offer making it suitable for work, play or relaxation. Its Green Leaf design coupled with the silver and black chiseled lettering makes it perfect for men who work or play in nature such as Landscapers, Gardeners, Tour Guides, Hikers, Bikers, Biologists or Botanists. Let the world know that you know how to get things done when you wear this unique shirt. Machine Washable. Refert to label for care instructions. This women’s Black Short Sleeve T-shirt is a 4.4 Oz, luxurious ring-spun Organic Cotton/Spandex Knit Blend with an attractive "InspirationMotivation.com" Fiery Logo on the front. This inspiring women’s organic "I Make It Happen" Short Sleeve T-shirt is 100% 4.3 Oz, Ultra Fine Combed cotton available in aqua, asphalt and black. This pretty Florida Keys Sunset Tote is 100% cotton 18.5X13.5X5.5 inches with rusty red accents and makes a perfect carry all for work or play. This "Believe In Yourself" Rainbow Tote is 100% cotton 18.5x13.5x5.5 inches with lime green accents and makes a perfect carry all for work or play. This Van Gogh Series Visitors From A Starry Night Neck Tie by Wanda Hope Carter transforms Van Gogh’s masterpiece into a vision of decorative fashion.